We made our standard visit to see the Whooping Cranes near Rockport, Texas. You can read about our first encounter with the Whoopers back in 2013 here. Although we were once again able to experience those amazing birds, we were not expecting the entire Rockport area to be devastated by Hurricane Harvey. We could barely tell we were in the right spot – most of the landmarks were gone along with every dock and many houses we’ve become familiar with over the many visits we’ve made. I’ll probably feature the pictures sometime in the future – for right now I can only imagine the struggle those residents must be going through to put their lives back together. Still remember how startling similar that area looked to the devastation tornadoes have left in our neighboring towns. With a subdued feeling, I was busy taking pictures of two Whoopers that were grazing in the area. Not that anytime is good time for a tragedy like Rockport encountered, it was still a relief that it occurred before these threatened birds had made their way down from Wood Buffalo National Park in Canada. With their numbers still in recovery, it is a tragedy if even one of the current population meets an unexpected fate. A medium sized white bird caught my attention while exiting the RV. Initially categorized it as a Snowy Egret and kept my attention on the rarer Whoopers. My brain has a tendency to continue processing scenes subconsciously long after I’ve turned my immediate attention to something else. This is one of the reasons it is difficult for me to get any quality sleep. On the positive side, it has likely saved my life more than once due to triggering alarm sensors when situations start playing out differently than first assessment. I never ignore a weird sense to duck ha. So, after a few pictures of the Whoopers, decided to give the bird that caught my eye another look. 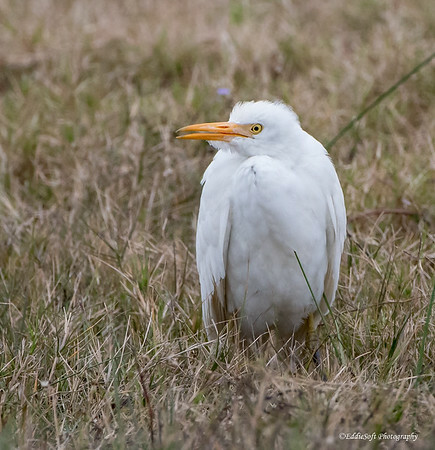 This time a proper assessment was made – “Hey dude, that looks like one of those Cattle Egrets!” Guess what my new Nemesis bird was after tinning the Hoodie?… yep, the Cattle Egret. There it was, the bird that should have been abundant at numerous birding sites we’ve traveled to. 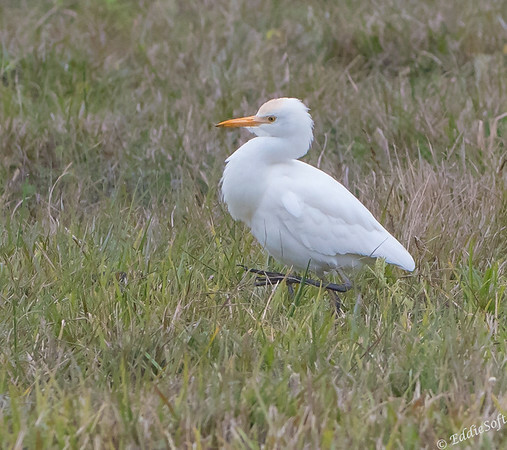 Short, thick yellow bill and smaller overall stature from the other Egret species. It also had the tell-tale golden coloring on the head. Finally, this bird could be checked off my list! Now, the intriguing thing was understanding what caused the mind to go into auto drive. The scene seemed benign enough on first glance – a somewhat marshy field near a large body of water, a group of Sandhills grazing a few hundred feet away, nothing too spectacular… or so my first process of the scene indicated. Apparently my subconscious correctly filled in the gaps my quick view overlooked. Now that my full attention had turned away from the Whoopers, more aspects were coming into focus. First off, was the fact that there were more than just birds in the area. There were ELEPHANTS there too! Sorry, that is a bit of a stretch. 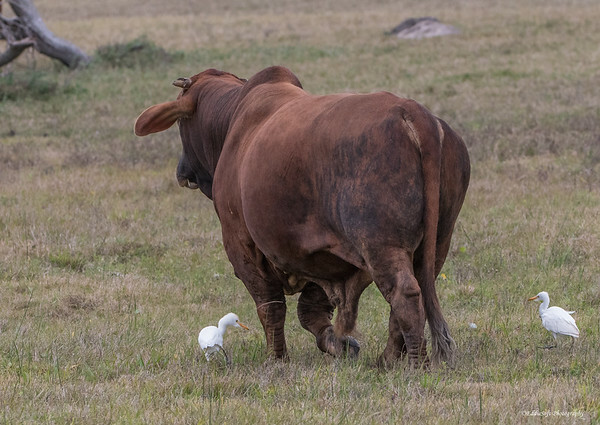 In reality, very near the Cattle Egret was one of the largest Bulls I’ve ever seen. That specimen was HUGE. How did I miss something that large on my first viewing? Mental note, do some visual tuning before getting behind the wheel again – this would have been similar to missing a truck coming right at me. Thankfully, my subconscious had successfully paired the “Cattle” specimen with the bird that tends to hang out in the same circles. Sometimes the bird name just says it all. 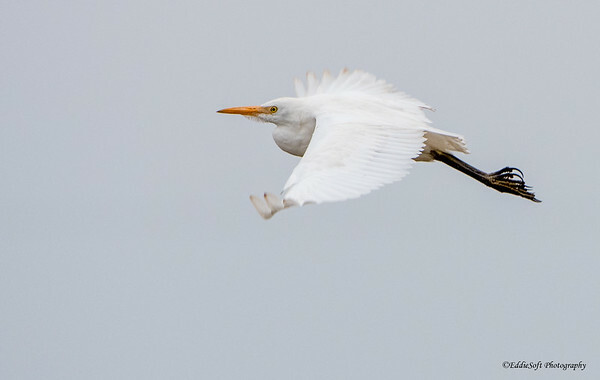 Talk about a great example of power of the Bull contrasted with the delicate Egret. 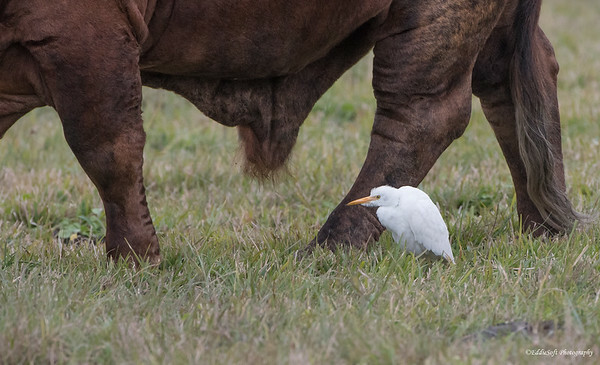 With one step, that Bull could crush that Egret flat, yet there was absolutely zero concern from the two Cattle Egrets that were busy running alongside and darting in and out between the tree trunk legs. Should probably point out at this time, the Bull couldn’t care less about these tiny intruders. Thanks to Cornell, learned that the Cattle Egret engages in this dangerous activity for nourishment. The Egrets feed off of the insects the Cattle stir up as they graze the fields. You will even see the Egrets perched on the backs of grazing animals chowing down on insects and to creep Ron out .. ticks. 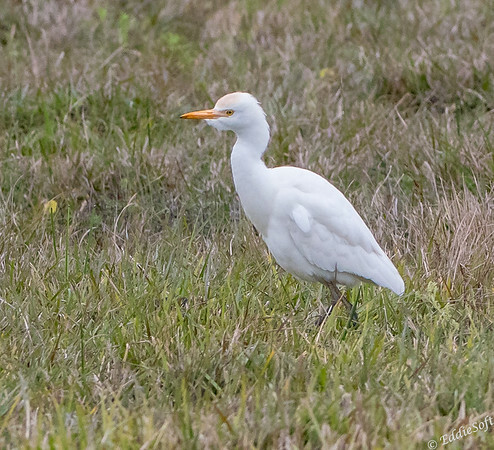 Clearly Ron and I need to figure out how to bring a Cattle Egret along with us while birding the tall grass fields. Almost out of pictures, better go find some facts to pass along in thanks for reading such a long post. Let’s see, first off, looks like the Cattle Egret migrated from Africa to South America in the 1870’s. By the 1940’s they had made their way into the US on their way to becoming the most prolific of our native Herons/Egrets. They are drawn to smoke taking advantage of insects fleeing the heat – out of the frying pan and into the throat. 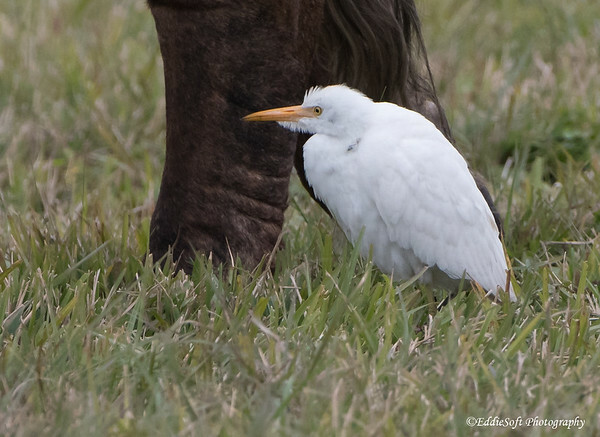 This fact made me chuckle – the Cattle Egret goes by many different names across its regions, yet it is fairly easy to figure out. Simply add the type of animal it is hanging out with and bingo, you are a regional name expert. See it next to an Elephant, then it’s an Elephant Egret. Find it next to a Rhino, well you guessed it, a Rhino Egret. Now spot it next to a Cow, then it’s a Cow Bird .. hey wait a minute, that’s gonna cause some confusion around here hehehe. This seemed like a fitting shot for “the end”. Hope you enjoyed reading about my latest check – another nemesis bird crossed off the list. Nice post Brian, strangely the Cattle Egret hasn’t got to colonise in the UK yet. 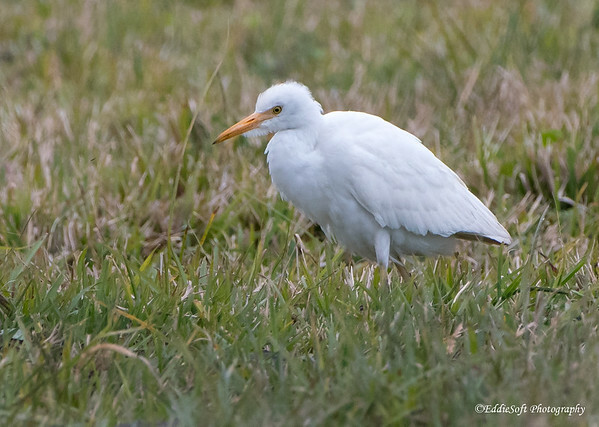 We get a few every year, migrants from Europe, but very few have bred, guess that will change with global warming as other egret/heron species are increasing. That bull was a beast! I’d give that a very wide berth! Thanks Brian! Surprised they haven’t taken hold over there yet, figure there are plenty of bugs over there to sustain them – give it time, as soon as they realize what tasty butterflies you have over there they’ll surely book some boat tours to the region ha. Luckily that bull was more interested in consuming enough grass to fill up those huge stomachs and didn’t really take notice of me. The flimsy barbed wire fence that stood between me and him wasn’t going to be too effective if he mistook me for a tall weed. As always, thanks for stopping by and taking the time to comment! OK, if you got a Hooded Merganser on a birding outing with me, I should expect a Cattle Egret on an outing with you! That’s one bird I’ve never seen. I have, however, been chased by a whole group of steers, about 40 of them, while birding, as you know! Scariest thing in my whole life. Not as massive as the bull here, but with 2-foot horns. I have not been back to that place since. Very nice pictures from different angles, even flying! The golden crown is pretty cool–I didn’t know they have that. Good thing the bull was not the excitable type or that fence would not have helped. Maybe it’s a myth, but perhaps we should avoid wearing red shirts when we go birding. The rule might of held water if you had produced a Ross’ Goose for me …ha. I generally do not understand the sheer multitude of wildlife/insectlife that have an a behavior pull to attack you – quite amazing and inevitable every time we go out something is dive bombing or pestering you. Think it might be some Buddhist thing where you were an inventor of pesticides or a pest control worker and this is your current life’s burden to bear as restitution. 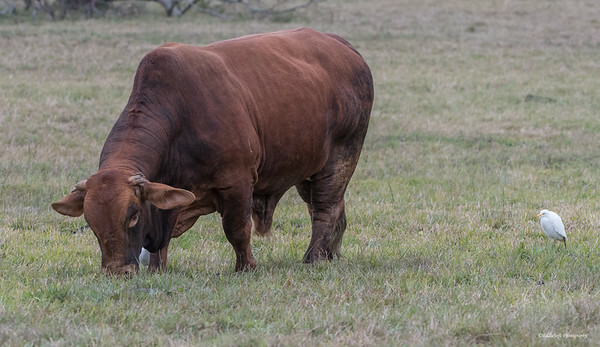 So even though it is hard for me to believe that a little o’l Steer would divert from its grazing to attack someone – in your specific case I am compelled to believe it. Unfortunately, I was unable to be there or I’d have pictures to share with everyone! Again, as far as that bull goes, it could care less about me … if you had been there, suspect we would be have been sprinting for our lives hehehe. Thanks for stopping by and commenting.